Krisean Performance Horses is very proud of its Arabian race bred broodmares. From the first days of racing our foundation mare, the remarkable Fulfilled Dream, we have indeed made our wildest horse dreams come true! Besides the 3 daughters of Fulfilled Dream that run through our pastures, we also have concentrated on the proven bloodlines of the immortal Arabian race horse, Kontiki. We feel our Arabian mares produce strong boned athletes that have the conformation to perform, sport a pretty Arab look and have the temperament and intelligence to win on the track and then come home to be a loving family companion. 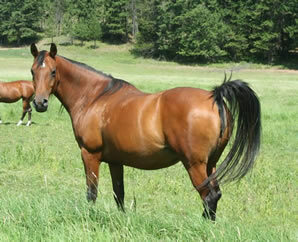 These mares are excellent crosses on quarter horses for babies that grow up to do it all! "Clearly"had a good run on the track before she retired to be one of our broodmares who is always the first to run (very quickly) to the fence for a pet, skratch and attention. Her full brother is Dreams of Valor a Hall of Fame runner with earnings of $261,117. 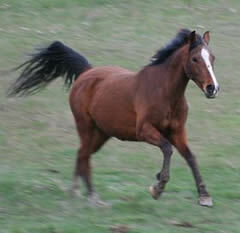 Clearly is one of our sweetest mares with solid bone and conformation, Arab style and extreme intelligence. 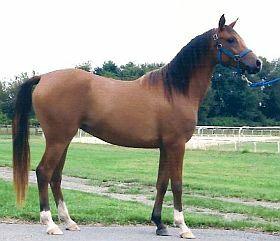 "Mirri" was bred by the highly successful and well known Arabian race horse breeders, CreRun Farm in Virginia. Her sire Tiki Tork Ku was exported to Turkey to help improve the state run Arabian race breeding industry. Her dam has also been exported into a Turkish race breeding program. "Dreams" is another Fulfilled Dream daughter by an Abu Farwa bred stallion, Solar Tzar. She lives up to her sweet name, has beautiful movement and the good conformation this line is known for. 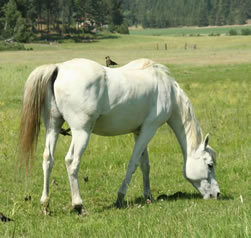 Dreams is bred to our perlino quarter horse stallion, Commander, for 2009 buckskin foal. Tiki Thyme was a successful race mare in her own right back when west coast racing was in its infancy, race opportunities were distances apart and purses were small. Tiki started racing as a 7 yr old, raced for 3 years with LTE of $8,422 in 10 starts. She was named Race Mare of OR two years in a row and retired sound to become a superior broodmare. Dam of Whissler, LTE $16,054 and our current runner, K Tiki Sprite, Cal Bred Race horse of the year for both 2007 and 2008 with LTE of over $50,000. 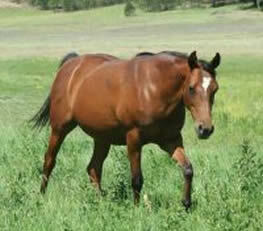 Also dam of our race stallion, Two Timin Tiki. K Tiki Sprite is our current track champion! Bred and raced by Krisean Performance Horses as was her dam K Tiki Thyme. 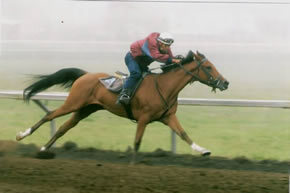 Named Cal Bred Race Horse of the Year for both 2007 and 2008 with LTE of over $50,000.